Every year Nonnie (my mother) buys a new ornament for her grandchildren with each of their names for her Christmas Tree. Eventually the tree with be full of ornaments that say Jonathan, Kristopher, Holly and Allison. Then she’ll have the perfect tree! She likes to have the kids put the ornaments themselves and I always try to get a picture of it. Here are this year’s “ornament hanging pictures”. 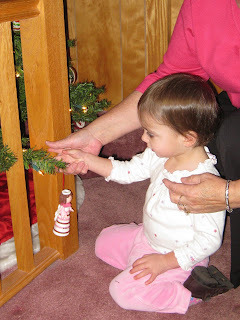 Allison wasn’t sure what she wanted her to do with it so Nonnie helped her. Holly was too quick so we didn’t get a picture of her putting it up, but she pointed to it for picture purposes, she’s such a great kid!